For a woman artist, it is even more daring to become a sculptor than a painter, and although there were famous women painters as early as the mid-1500s, it is rare to see a sculpture by a woman that was made before the 1800s. 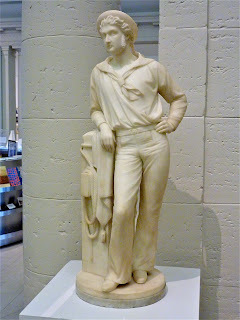 As we travel around the country, I make a point to collect images of sculptures by women. I took all the photos in this post during our 2012 art journey. 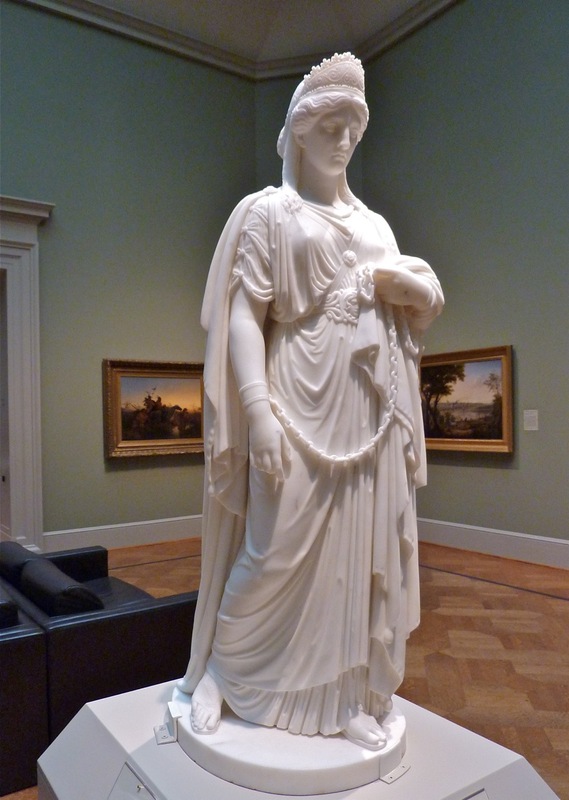 Among the first notable American sculptors is Emma Stebbins, 1815-1882. She was raised in a wealthy New York family and encouraged to study art from an early age. During the 1800s there was a sort of fad for American sculptors to study in Rome and Emma was part of that. In Rome she was able to pursue a bohemian and lesbian lifestyle that would have been less tolerated at home. 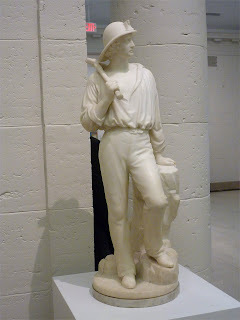 What I like about her is that she depicted idealized working men, as opposed to mythical figures. Another member of Stebbins' circle in Rome, Harriet Hosmer, made sculptures of mythical figures, which are more typical for the 19th century. One of the most popular women sculptors in American museums is Anna Hyatt Huntington. Although she could do excellent mythical figures, she is more well known for her naturalistic depictions of animals. Anna was encouraged to develop her artistic talent by her father, a well-known professor of paleontology and zoology. Anna was at the peak of a successful career in 1923 when she married Archer Milton Huntington, heir to a railway fortune, scholar of Spanish literature, and philanthropist. She continued her career and he built special venues for her work. 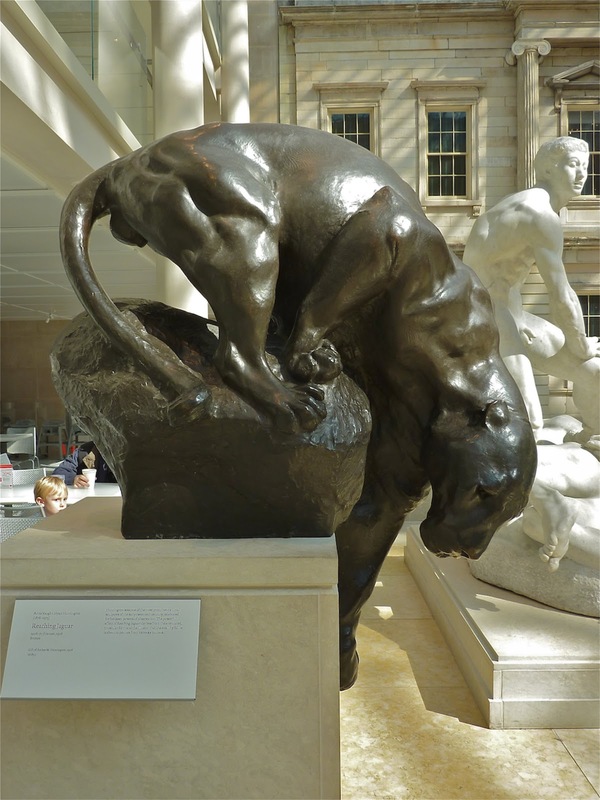 The woman who has done the most exciting treatment of the female form is Harriet Whitney Frishmuth, who generally worked in bronze. She has the distinction of having studied with Auguste Rodin in Paris. Her slender figures are typically stretching toward the sky. 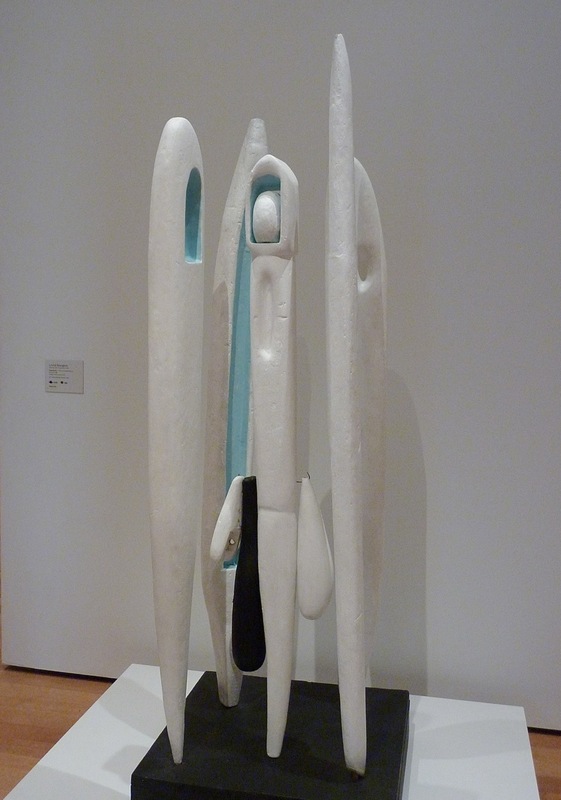 In the 20th century, women sculptors virtually abandoned the figure and made mostly big bold abstract works. 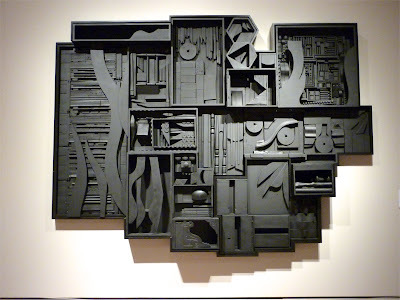 Louise Nevelson may be considered an early re-cycler as her sculptures are typically formed of scraps of wood from a lumber yard. She unified and dignified them by painting them a single color, usually all black, but sometimes all white. 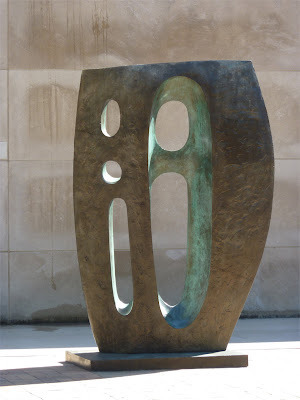 The most respected of British women sculptors is Barbara Hepworth, who is generally over-shadowed by her male contemporary Henry Moore. I really like her smooth, simple forms. One of the most innovative American sculptors of the 20th century was Louise Bourgeois. Instead of working within one basic style like the other sculptors we've considered, she was constantly experimenting with new forms and materials. In the 1950s she was making vertical forms from painted wood and giving them scientific-sounding titles. To her great credit, she continued to innovate into her nineties. In 2001 she designed a work to serve as a gateway to the Williams College Museum of Art that consists of a series of sculptures on a landscaped hill. 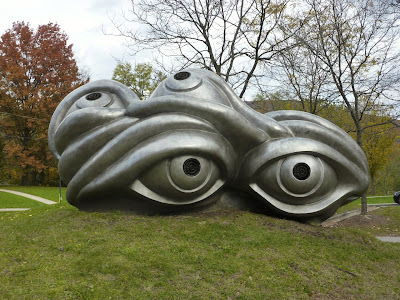 The sculptures are eye-like forms with benches for seating on their back sides. 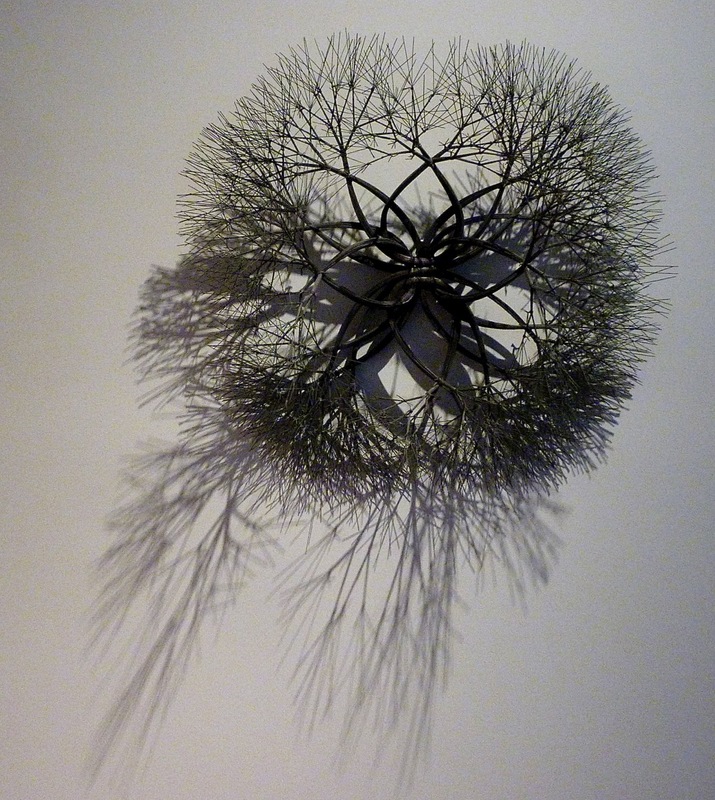 A big favorite in California is Ruth Asawa, who is still living. Born in southern California to a Japanese family, she has been a renowned artist and educator in San Francisco for several decades. Although she first achieved major recognition for her public fountains in San Francisco, most of her astonishing work is done in wire. What is an American name? 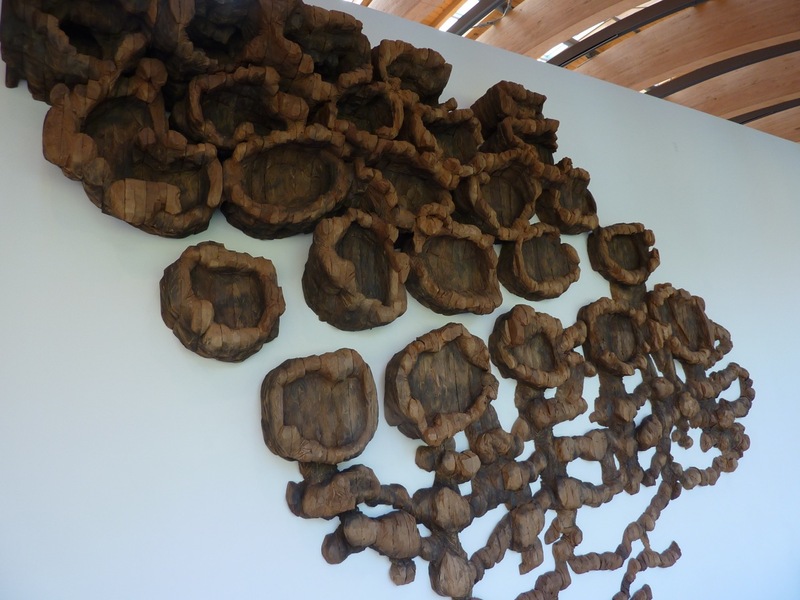 At Crystal Bridges Museum of American Art in Arkansas, a visitor puzzling over a large, macho-looking, wall-mounted wood sculpture exclaimed, "Ursula von Rydingsvard is not at American name." What is typically feminine? She went on, "Surely a woman didn't make that! It looks like it was hacked out with a chain saw!" Crystal Bridges gives very good coverage to women sculptors; I took several of these photos there. 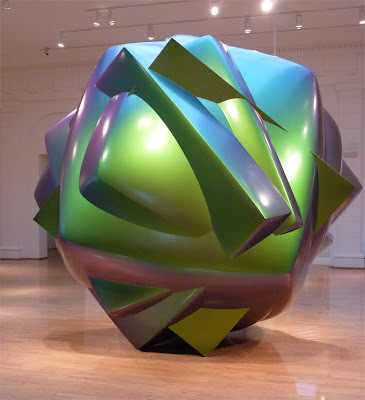 One of my favorite contemporary sculptures was made by Liz Larner, who was born in 1960. I've only seen this one work by Larner, but from the internet I see that she is from California, and she works with a wild variety of forms and materials. In the last few decades, artists are less likely to create free-standing, single forms, and more likely to produce installations with multiple pieces. Artists don't stick with one material, and they don't necessarily fabricate the project with their own hands. A major breakthrough for artists in general was to realize that the idea or vision is the main dynamic in any work of art. The idea may be so large or so complex that a team of specialists is required to realize it, or the material may require some industrial process. 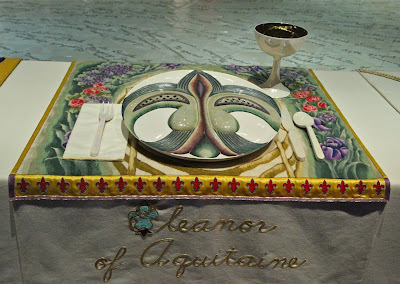 Although she is generally considered a painter, multi-talented Judy Chicago was a major pioneer of installation art with a work on women's history that she created in the 1970's called The Dinner Party. Chicago's idea was that women have been generally left out of "his-story": they don't get a place at the table. 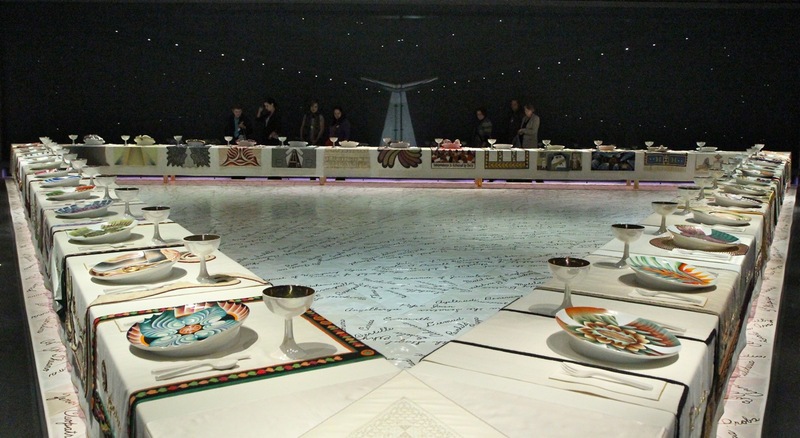 So she imagined a triangular table for thirty-nine of the most important women in history, thirteen on a side. 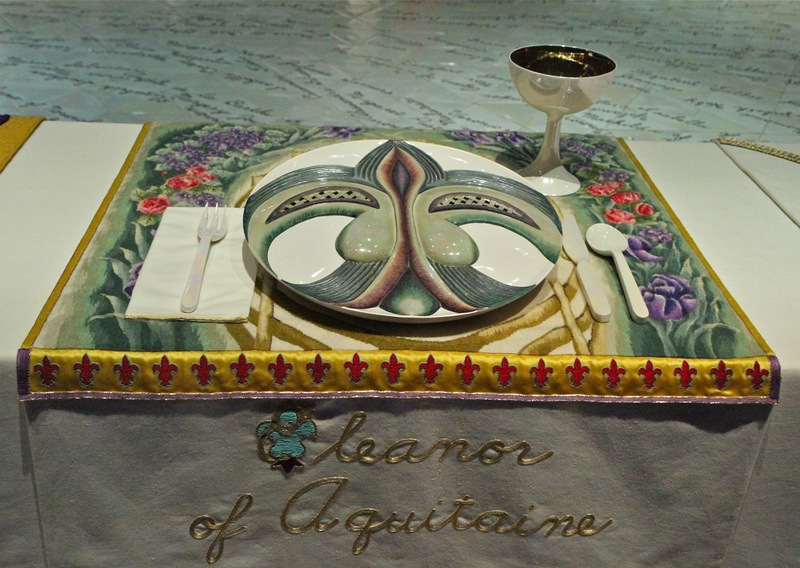 Each woman was represented by a placemat embroidered with symbols and a plate formed in a symbolic shape. 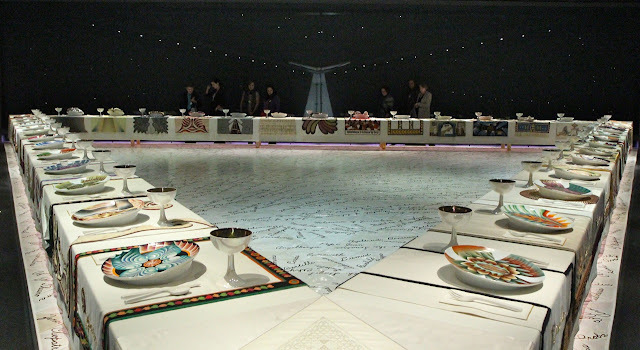 To bring this idea to reality she assembled a team of women who were already well-known in their crafts; part of her vision was to celebrate women's traditional crafts. 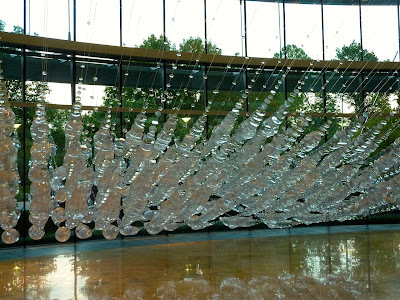 My favorite installation artist is Allyson Shotz. She is pre-occupied with fluidity and reflected light. She might express that in any medium, and her work requires a team of software guys and another team of installers. I have seen three magical installations now that use different arrangements of fresnel lenses to play with the ambient light. 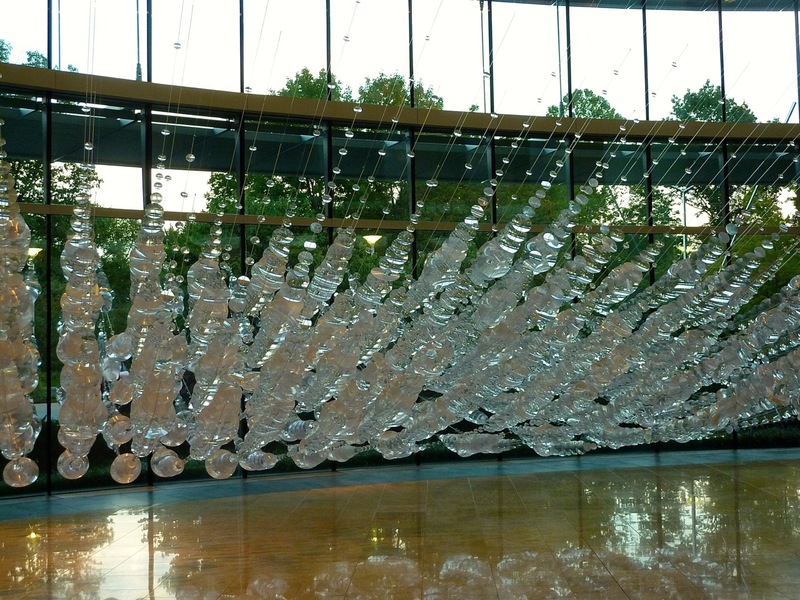 However, a major show of Shotz's work that we saw in Indianapolis on our 2012 journey included giant photos of computer-generated bubbles streaming through space plus a couple of mesmerizing animated movies. 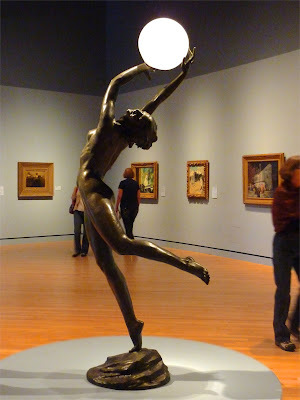 If you would like to see more photos of sculptures by women in American art museums, you can go to my website. This is a rich synopsis of some pivotal women sculptors who are not always in the limelight. It is enhanced by your fabulous photos of their work. Thank you for creating and sharing this jewel with us, Jan.